Did you ever think that butternut squash could be breakfast food? 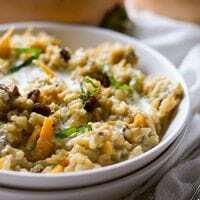 Plump raisins and fragrant cinnamon combine in this simple, light, and delicious Butternut Squash Rice Porridge. Mmmm! It's got all of your favorite fall flavors, wrapped in a warm bowl with a drizzle of raw, heavy cream. What if you have only butternut squash or pumpkin puree? No worries! Just use what you have but increase the milk by a few tablespoons. Simple, light, and delicious, this Instant Pot Butternut Squash Rice Porridge is a nice change from classic oatmeal for breakfast. With plump raisins, fragrant cinnamon, and perfect sweetness, this porridge will be a hit at your table. 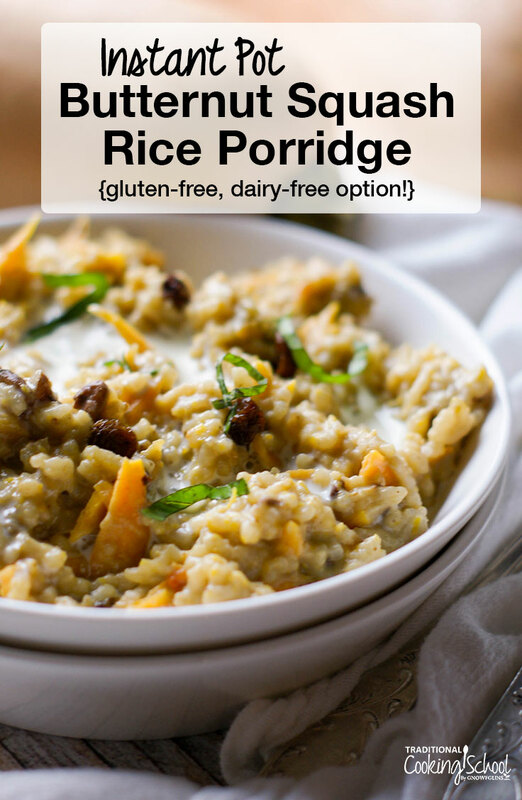 It's naturally gluten-free and has a dairy-free option for an allergy-friendly breakfast! If using an electric cooker such as the Instant Pot, press the "Saute" function. If using a stovetop cooker, place on burner over medium heat. Add butter to the insert pot and let melt. Add the soaked and rinsed rice. Stir to coat all grains in butter. Add squash, raisins, sea salt, sugar, cinnamon and milk. Stir to combine. When cycle is complete, turn off (if electric cooker) or remove from heat (if stovetop cooker). Let sit for 10 minutes to naturally release pressure. Then quick release any remaining pressure. Carefully open cooker. Stir porridge and adjust salt and sugar, to taste. Serve immediately with garnishes of choice! Enjoy! Rinse rice, then cover in room temperature water. Let soak for 12 hours or overnight. After 12 hours, drain and rinse the rice, shaking the colander back and forth to remove excess liquid. This soaking process reduces phytic acid, allowing the nutrients in the rice to be absorbed by our bodies. If desired, you may skip this soaking step. Simply increase milk by 1/2 cup and proceed as instructed. What's The Difference Between Summer & Winter Squash? While summer squash (think zucchini and yellow crookneck) need not be peeled, winter squashes like pumpkin, spaghetti, and butternut have a hard, inedible skin. This is why they can be kept for so much longer than summer squash. Therefore, with the fall season upon us, varieties of winter squash now fill the supermarket bins. No wonder there's a plethora of butternut squash recipes floating the Internet! It's hardy, nutritious, and versatile. Have you ever had butternut squash for breakfast? Will you try this porridge? I use sprouted rice so I could skip the soaking step. Any thoughts on how that might affect the liquid requirements? Can i use other ingredient instead of coconut sugar?